Google has very good news for Indians after striking a partnership with bullion refiner MMTC-PAMP India to allow Google Pay users to buy and sell gold through the mobile appliaction, a service that is already been provided by Paytm, Mobikwik and PhonePe. Through this new association with India’s only LBMA accredited gold refinery, Google Pay users will be able to buy 99.99 per cent 24-karat gold, Google said in a statement. 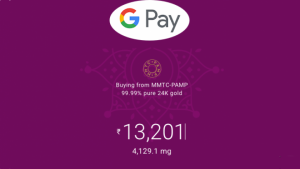 Google Pay users can invest and buy gold for any value and that will be stored on behalf of the user, by MMTC-PAMP, in secured vaults. The users will have an option to buy and sell this gold any time at the latest price, refreshed every few minutes on its platform and as displayed on Google Pay app. The announcement comes a day after the Delhi High Court asked the Reserve Bank as to how was Google Pay was facilitating financial transactions without its authorization. The court issued notice to Reserve Bank of India and Google India seeking their clarifications on the matter. The spokesperson had stated that the company is mindful to prioritize data security and that it is committed to complying with the Indian laws. “In order to support our partner banks, our efforts in complying with the government’s data localisation norms are underway, and given the scale and complexity, we are being mindful to prioritize data security and uninterrupted services to our users as we make this transition. The central bank is apprised of the progress and we remain committed to complying with the laws of the land,” the spokesperson had said.